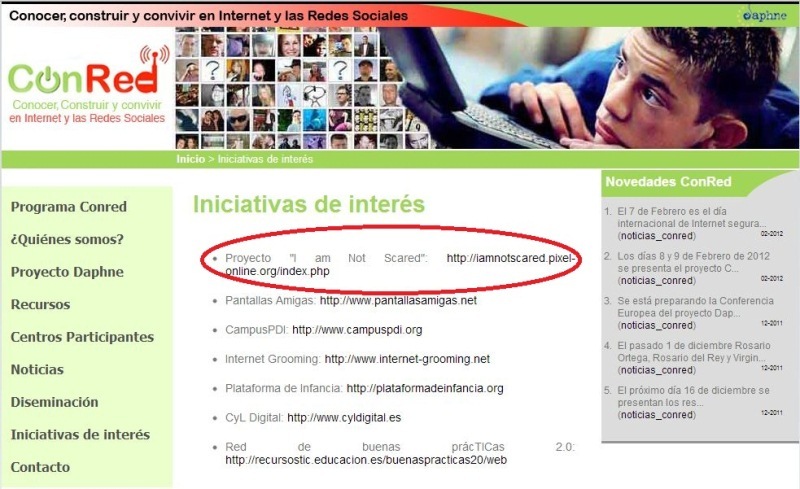 The I Am Not Scared project partnership made contacts with web sites focusing on the fields of education and training. The I Am Not Scared project was presented to the web masters and a link to the I Am Not Scared project portal was made so that those who will access the selected web sites can also access, through a direct link, the I Am Not Scared portal. ““Together against drugs and violence” is a project promoted by the School for children with special educational needs “P.R. Slaveykov”, Pleven. The school joined the “I am not scared” project as a participant, beneficiary. The promotion of the “Together against drugs and violence” incorporates also information on the “I am not scared” initiative and provides information about the project together with a direct link to the I Am Not Scared Portal. There are many users of the school facebook account that may now learn about and benefit from the I Am Not Scared project. The School for children with special educational needs “P.R. Slaveykov”, Pleven joined the “I am not scared” project as a participant, beneficiary. 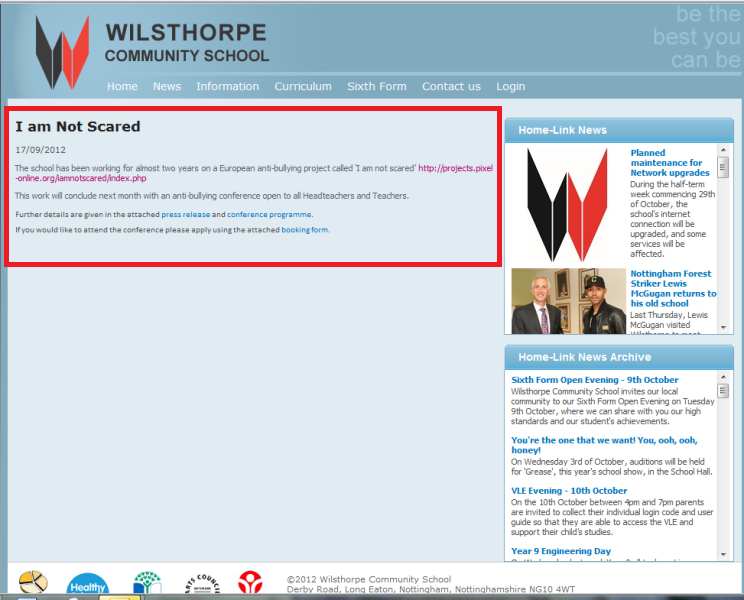 The local counsellor supported us in the development of a “I am not scared” page on the school web-site. 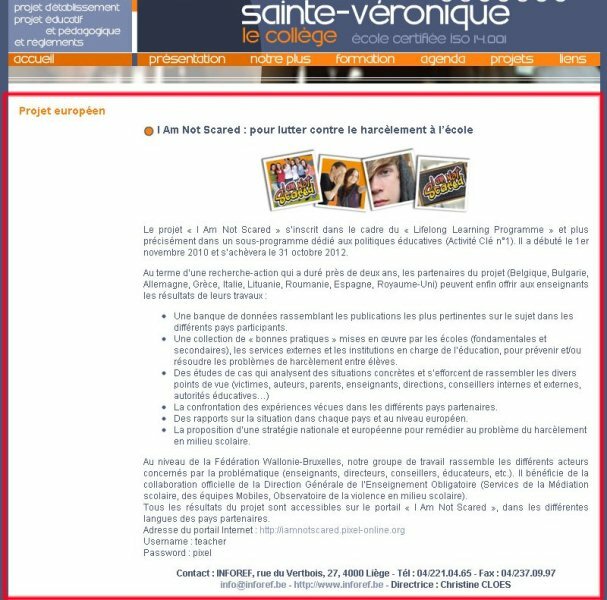 The page provides information about the project together with a direct link to the I Am Not Scared Portal. 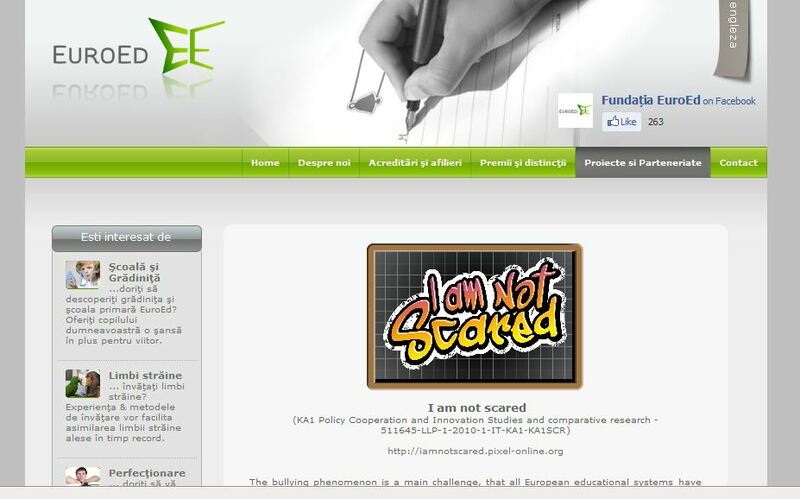 There are many users of the school web-site that may now learn about and benefit from the I Am Not Scared project. DARIK News is a national media network using mainly radio and online communication channels. The publication on the regional web-site of the DARIK on the “I am not scared” project provides information about the current project developments – the achieved development of the 50 BG publication reviews and the forthcoming good practice selection phase. There is a link to the project portal. There are many users of the DARIK online news that may now learn about and benefit from the I Am Not Scared project. “Sava Dobroplodni” Shumen is a general secondary high school with intensified training of foreign languages and arts. The school is a UNESCO associate and has been specified as a school-base for Russian language by the Ministry of Youth and Education and the Russian Cultural and Information Center in Bulgaria. 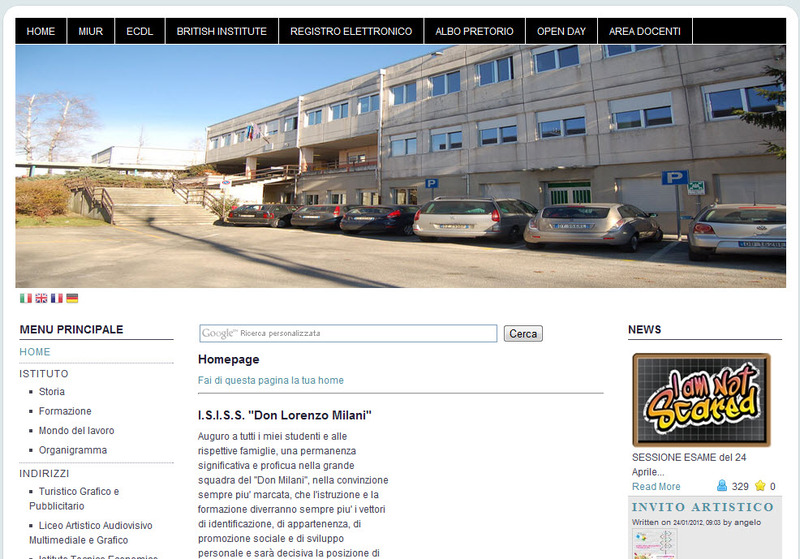 On the school web site there is a dedicated page presenting all projects, in which the school participates. The web-site provides information on the “Brave enough to be kind” project against bullying. It gives details on the project objectives, activities and partners, as well as links to valuable content, including web-links to other thematic web locations, which deal with the same issues. 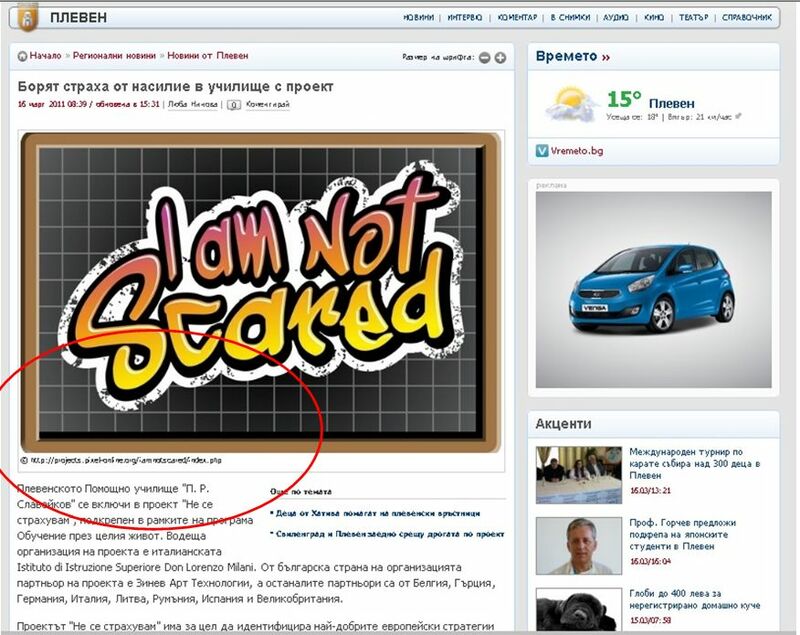 Recently the counsellor from the BG school partner in the “Brave enough to be kind” project – Secondary general education school “Bacho Kiro”, Pavlikeni, Bulgaria joined the “I am not scared” project and placed a link to the “I am not scared” web-site. The web-site provides information on all school news and activities, as well as the initiatives, in which the school participates. Right after officially joining the “I am not scared” project 138 Secondary school “Prof. Vasil Zlatarski” placed a link and a brief info on the project on its web-site. 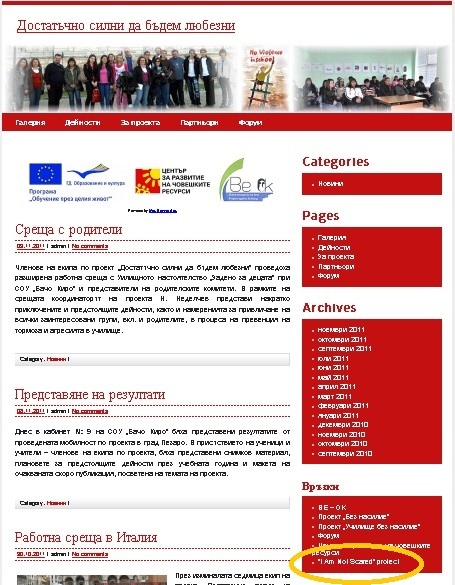 The info bears a link to the project portal and a link to the project presentation in Bulgaria developed and provided to the school by the BG partner. Kaunas University of Technology is partner in the “I Am Not Scared” project. KTU is the largest university in the Baltic states, a leader in research and study in various fields. 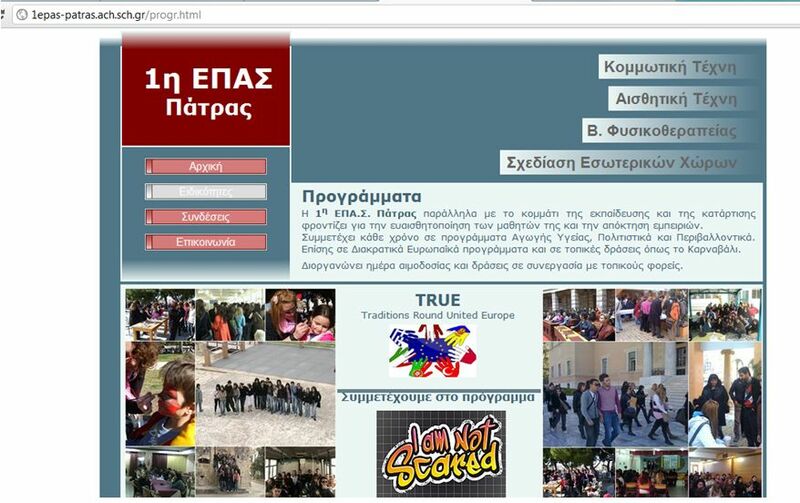 KTU website provides project number together with a direct link to the I Am Not Scared Portal. 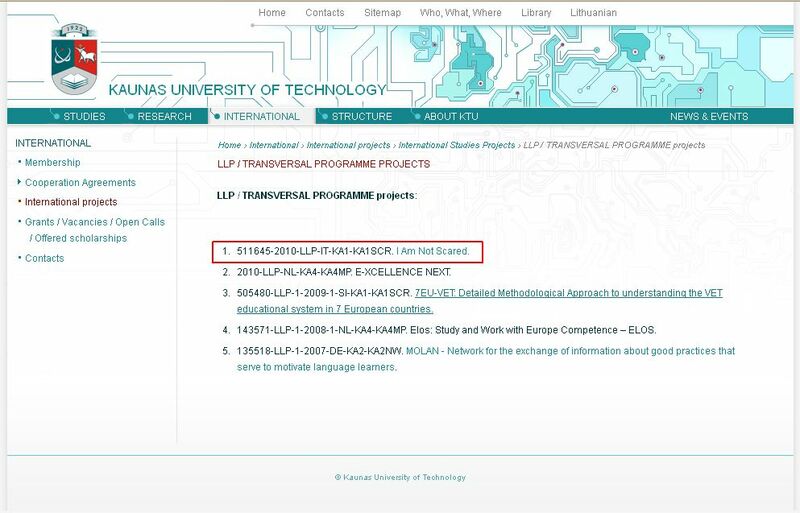 There are many students and other users of KTU website that may now learn about the project and its activities. Skudutiškis Academy – participates as public authority - is non-governmental and not-for-profit organization. These activities are: adult learning, additional education for juveniles, child day care centres, training and consulting services, projects’ increasing family social and economical status, active citizenship, support and help in different families’ activities. Skudutiškis Academy pays special attention to the children from the social risk families. Organization helps those children to adapt to their local communities. 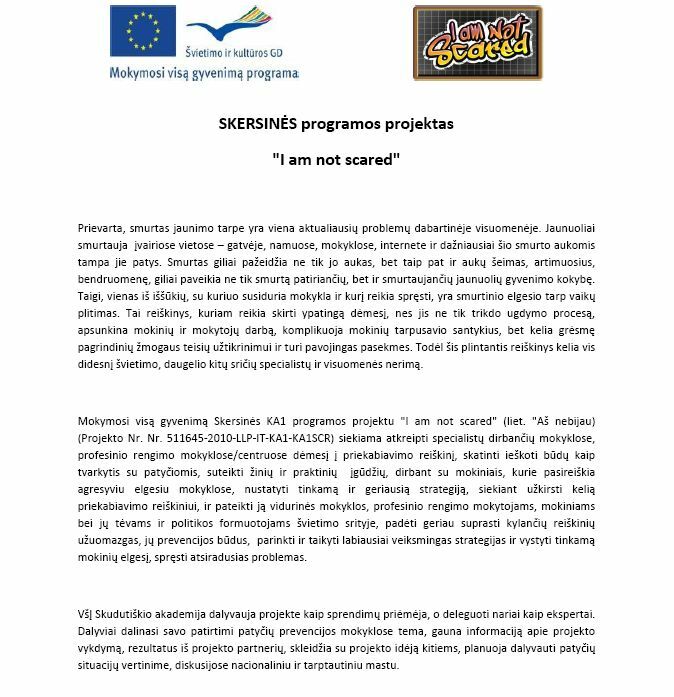 Skudutiskis Academy (SA) website provides information about the projects where SA is involved or participates, between them there is LLP KA1 project “I Am Not Scared”. Institution participates as associated partner - public institution’s purpose is to promote the knowledge society actively, while creating and developing services related to ICT, innovation and practical adaptation of education and professional and community activities seeking to ensure the quality of cooperation and unity between different generations and different social groups. VšĮ “eMundus” provides project logo (as banner) with as a link to the project portal and in the news section it is provided information about project and its actuality. 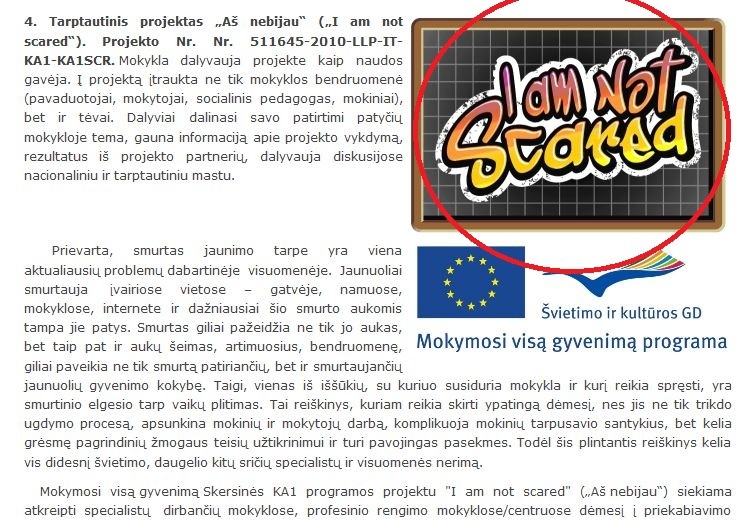 Kaunas Juozas Grušas Art secondary school website provides project description, main information together with a direct link to the I Am Not Scared Portal. The children and parents attending this school can learn about the project and its usefulness. 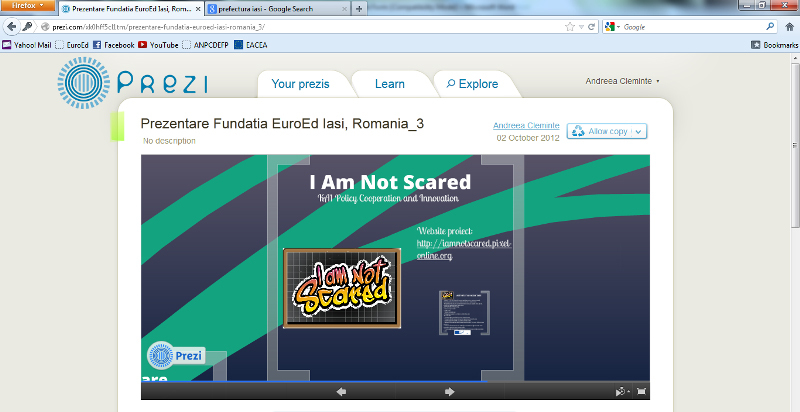 Academy’s Ugnes Karvelis Gymnasium’s website provides project’s logo as a direct link to the I Am Not Scared Portal. The children and parents attending this school can learn about the project and its usefulness. Dainava Youth Center (participates as associated partner) is the only such center in Kaunas where are integrated various services for teenagers and youth. These services focus on psychological support, health promotion, and preventive health services. Dainava Youth Center is the only such center in Kaunas where are integrated various services for teenagers and youth. These services focus on psychological support, health promotion, and preventive health services. Titas Masiulis is a youth schools that aims to foster young people’s creativity, to educate them, to help them solve their personal problems and to understand their best skills and also to give them qualified pre-vocational training. The school placed information about the project that they actively participate in. Kaunas - one of the most academic city in Lithuania, with 6 universities and 5 higher education institutions, also active different NGO's working together. The city has partnership with many towns in Europe. Therefore the announcement with project logo and brief description of the project placed in the official website of this institution will be read by a lot of people. Šiauliai Rasos pro-gymnasium provides project title in Lithuanian with as a link to the project description and its actuality, with pictures from the meeting with project coordinator, etc., where direct link to the project portal is also given. 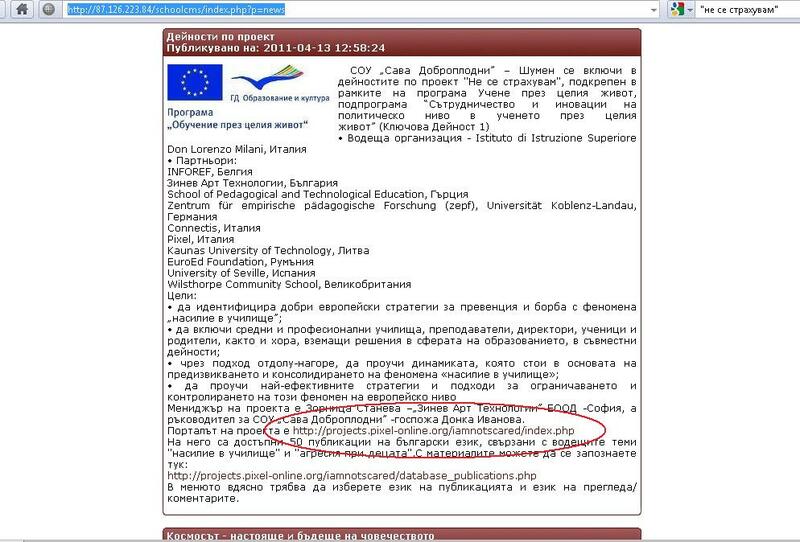 The portal is founded by Centre of Information Technologies in Education and by the Ministry of Education and Science of the Republic of Lithuania. The main aim of the portal is to allow educator, students and their parents to access educational information and give electronic services. 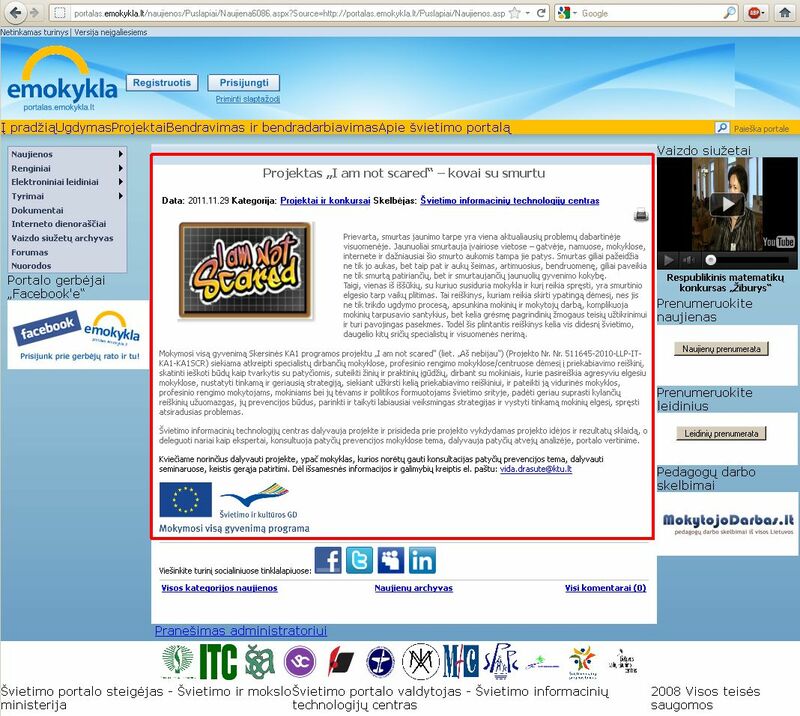 Institute placed a logo, detailed information about the project in the website www.emokykla.lt in hot news section and gave invitation for schools and institutions, which want to join the project as beneficiaries, as public authorities, it is provided in the end of the project description. This portal is very famous between the schools; therefore we expect to attain more participants and beneficiaries, to spread information between schools. EuroEd is partner in the I Am Not Scared project. The people intrested in the EuroEd Foundation activities can access the institutional web site and can read in EN or RO about the Foundation. 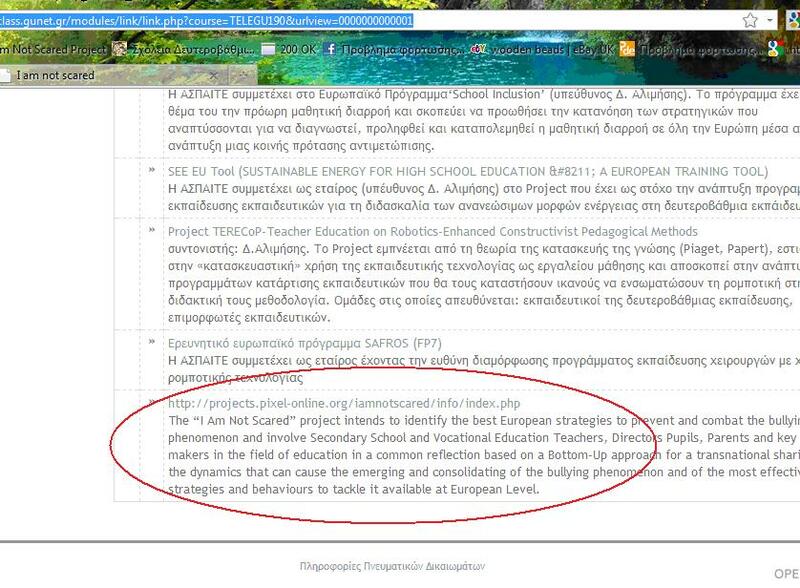 At the section projects and partnerships can read about all the EuroEd projects, including the I am not scared project. The project page includes the description of the project, link to the project website and the project brochure. 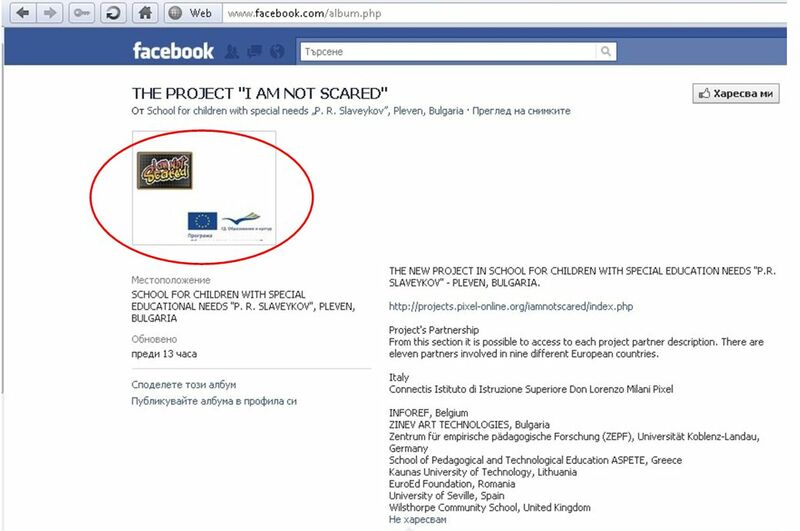 The people interested in the EuroEd Foundation activities can access the institutional Facebook page and can read about the EuroEd projects, including also the I am not scared project. The project page includes the description of the project, link to the project website, photos, and news on the project. Short video presenting the EuroEd Foundation activity and projects. The video has been uploaded on the youtube.com to have greater visibility and to be used during different dissemination activities. This is an interactive classroom platform used for the purposes of the educational technology training course of EPPAIK Patras. The web site presents a short description of the project, as well as the link of the project. This is a web site of the Regional Directorate of Primary and Secondary Education in Western Greece and it is mostly visited by the primary and secondary schools of Western Greece (which includes the schools of Achaia, Ilia and Aitoloakarnania Prefectures) and their teachers. The web site just includes a project link in the category. 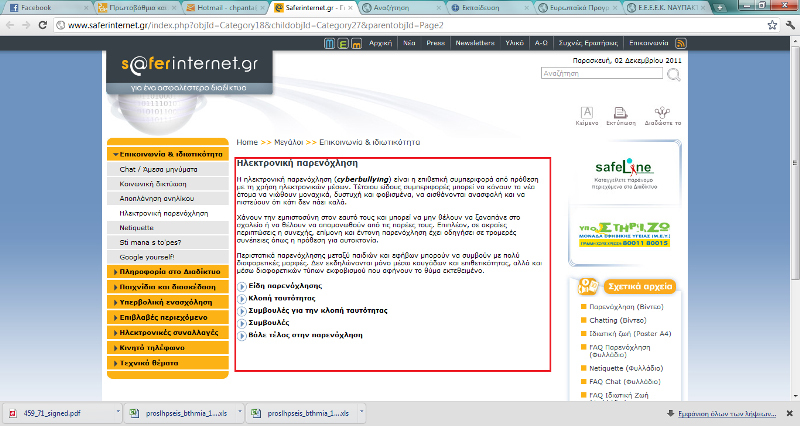 This is a national web site about youth, which is under the supervision of the Ministry of Health and Social Solidarity. The web site deals with all the important issues of adolescence and provides information in a range of various matters. 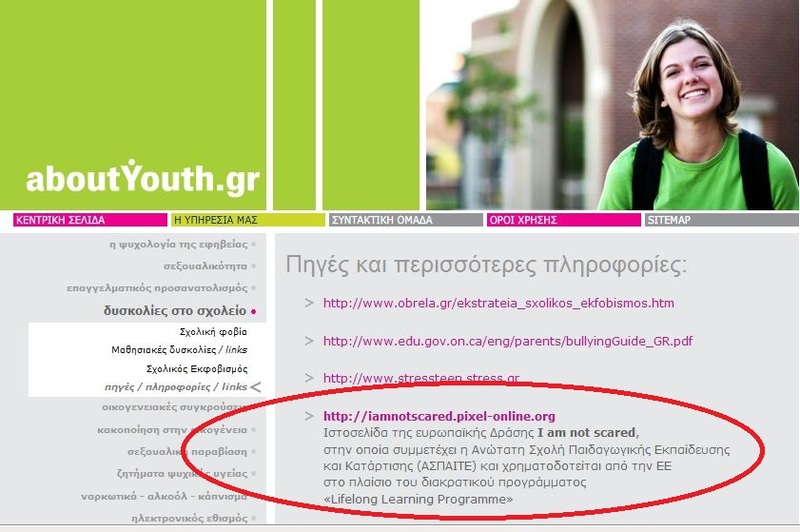 The link to the project “I am not scared” web site is made under the topic “Difficulties in School. This web site covers a variety of issues concerning young people and thus is often visited by pupils. Apart from the link provided in the web site, a short description of the project is also available. 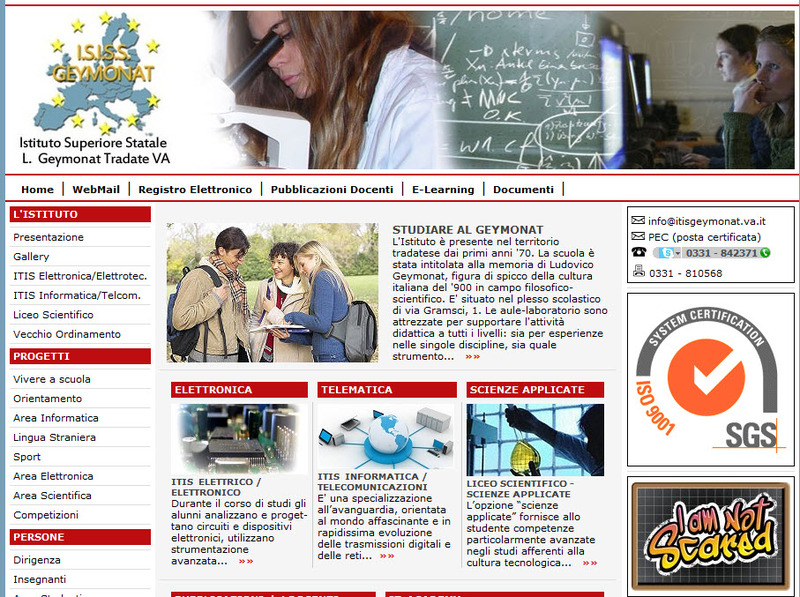 This is a web site of the laboratory of educational technology in Patras. A short presentation of the project is presented and focused on the activities of the Greek team (in Greek and English language). 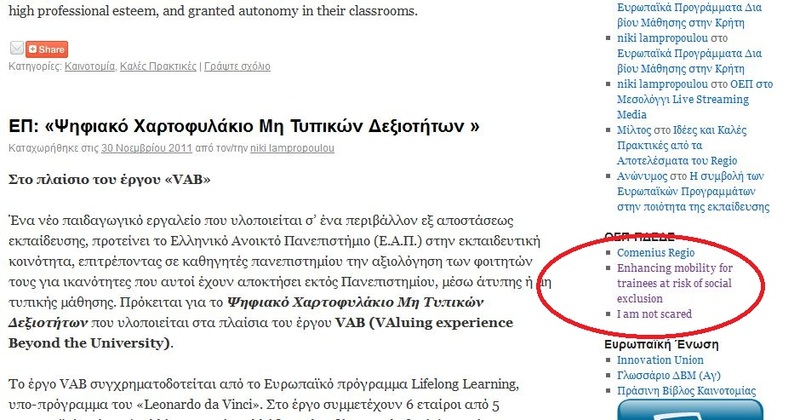 The 1st vocational school of Patras has added to its web site a web link to the project portal. This school is one of the schools participating in the “I am not scared” case studies research. High school Don Milani is promoter of the I Am Not Scared project. 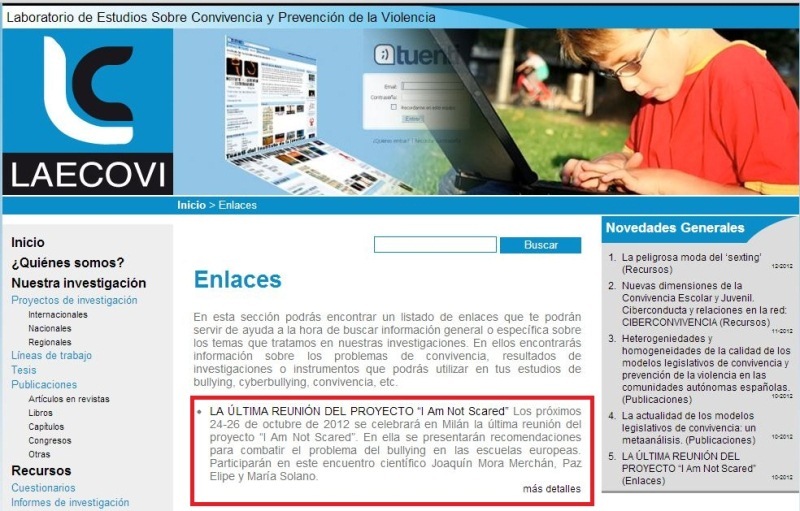 Its website provides information about the project together with a direct link to the I Am Not Scared Portal. There are many users of Don Milani’s website that may now learn about and benefit from the I Am Not Scared project. High school Gandini is school partner in the I Am Not Scared project. Its website provides information about the project together with a direct link to the I Am Not Scared Portal. 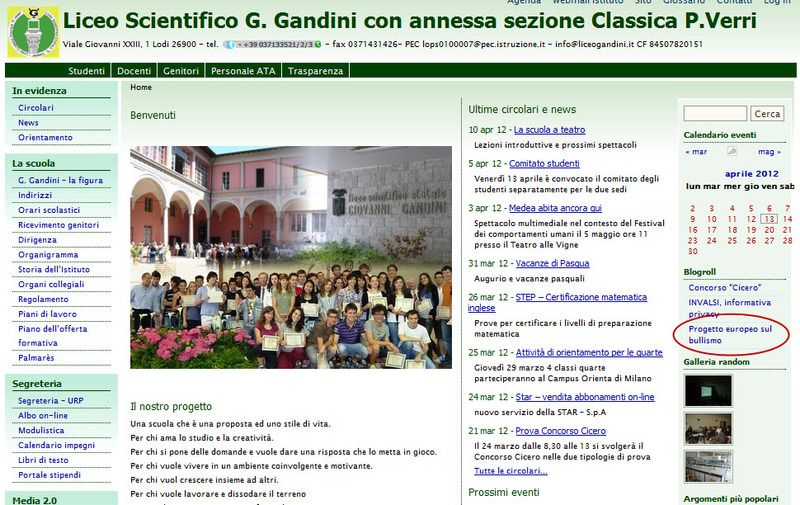 There are many users of Gandini’s website that may now learn about and benefit from the I Am Not Scared project. High school Geymonat is school partner in the I Am Not Scared project. Its website provides information about the project together with a direct link to the I Am Not Scared Portal. There are many users of Geymonat’s website that may now learn about and benefit from the I Am Not Scared project. 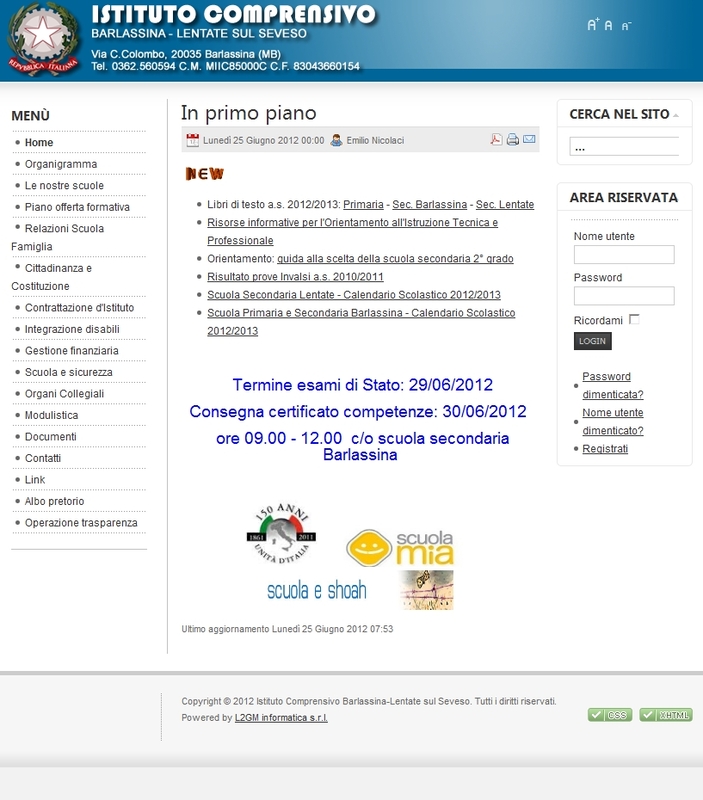 Institute Santa Teresa di Riva is a secondary school in Sicily and it is school partner in the I Am Not Scared project. Its website provides information about the project together with a direct link to the I Am Not Scared Portal. SlideShare is the world's largest community for sharing presentations. With 60 million monthly visitors and 130 million pageviews, it is amongst the most visited 200 websites in the world. SlideShare features a vibrant professional and educational community that regularly comments, favorites and downloads content. SlideShare content spreads virally through blogs and social networks such as LinkedIn, Facebook and Twitter. Individuals & organizations upload documents to SlideShare to share ideas, conduct research, connect with others, and generate leads for their businesses. Anyone can view presentations & documents on topics that interest them, download them and reuse or remix for their own work. Share ideas about the project and connect with others to ensure the visibility of the project and to collect feedback and suggestions from other countries. Prezi is cloud-based presentation software that opens up a new world between whiteboards and slides. The zoomable canvas makes it fun to explore ideas and the connections between them. The result: visually captivating presentations that lead your audience down a path of discovery. Share ideas about the project and connect with others to ensure the visibility of the project and to collect feedback and suggestions from other countries. 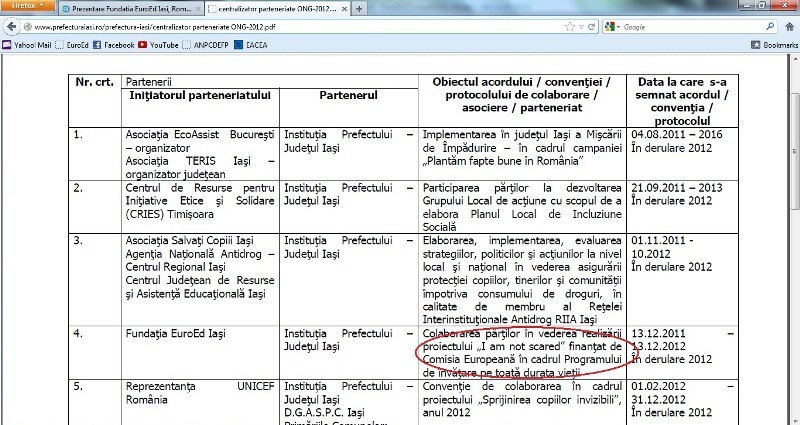 The Prefecture of Iasi County – mention about the project on the institution website on the list with all the collaboration partnerships with NGO’s and representing their involvement in the European projects. The Prefecture of Iasi County is a very important institution for Iasi, in terms of decision makers, taking and approving strategies and polices related to the education field. Also the institution has an important role in creating links between organizations. 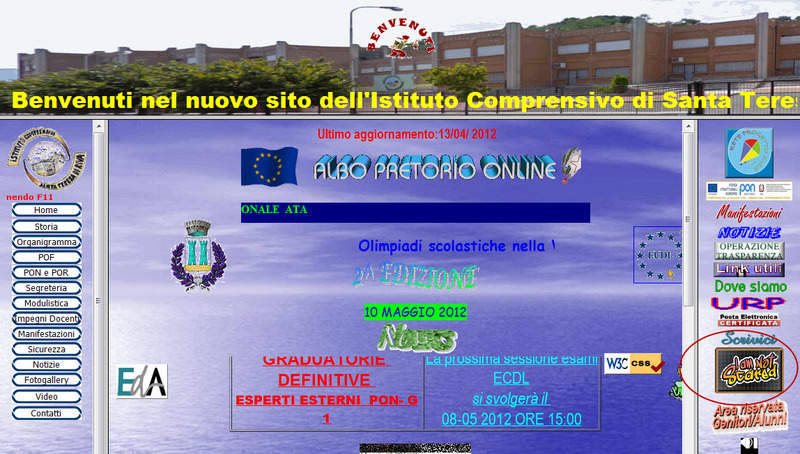 The main object of the site is to provide information about the school for parents, students etc. The web site gives a short description of the ‘I am not scared’ project, mentions the school role in the project and also gives a link to the project web site. The main object of the site is to provide information about the school for parents, students etc. 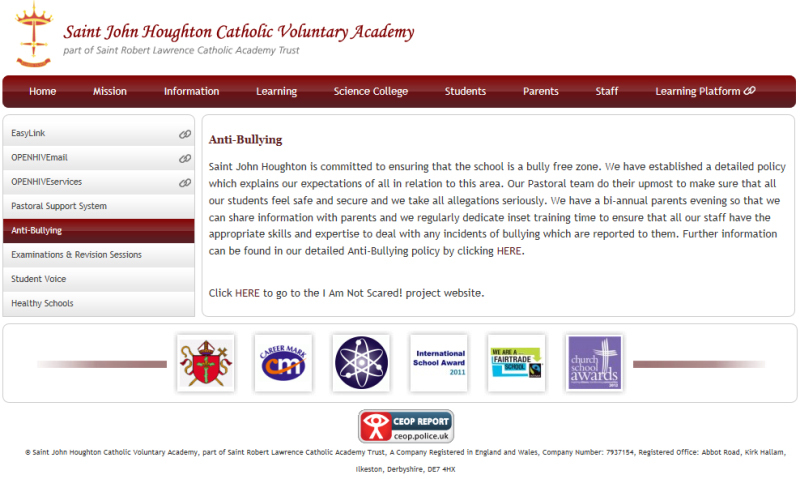 The web site gives a short description of the school role in combating bullying and gives a link to the project web site. The main object of the site is to provide information about the school for parents, students etc. 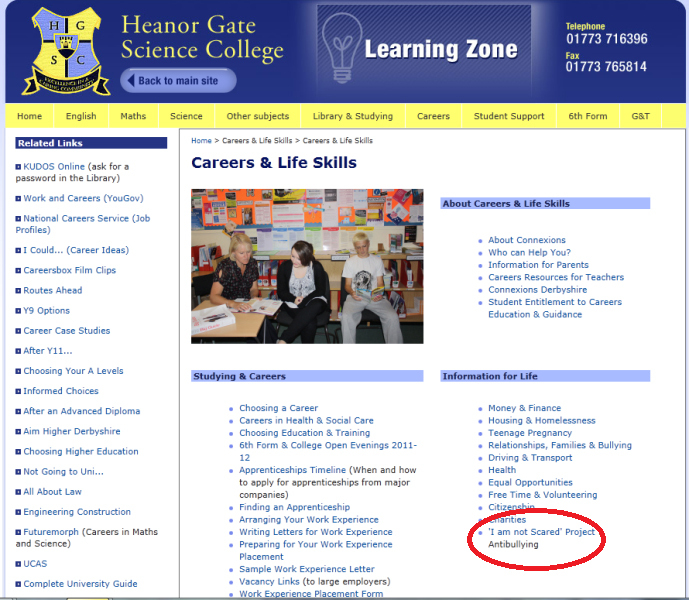 The web site gives a gives a link to the project web site as part of the ‘information for students and parents. The main object of the site is to provide information about the school for parents, students etc. 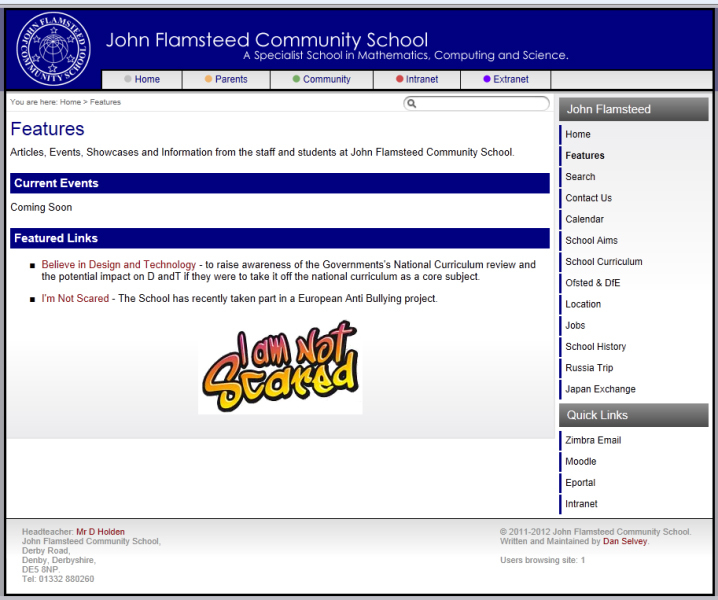 The web site informs parents that John Flamsteed Community School has recently taken part in an anti-bullying project called "I Am Not Scared" and there is a featured link to the project web site. 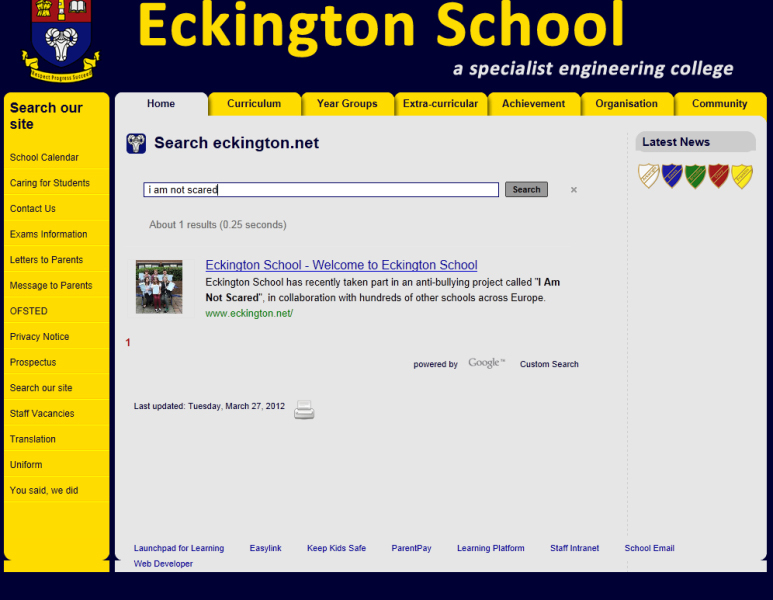 The main object of the site is to provide information about the school for parents, students etc. The web site informs parents that Mrs Foxley-Johnson, Anti-bullying co-ordinator of the college has been involved in the ‘I am not scared’ project and has link to the project on the school web site. The Key’ is a ‘members only’ site which provides information for school leaders. The ‘I Am Not Scared’ web site is now listed as an additional source of information for further reading, and includes a link to the web site. Kėdainiai District Municipality provides project description in their official website www.kedainiai.lt with project logo and useful links to project portal (project members and involved institutions from Lithuania). This is the municipality, so it has a lot of influence thus similar information will soon be uploaded to other educational institutions of this district. This is the youth web-portal of the ministry of education, youth and science, which provides updated information on events, projects, initiatives on the topics of youth, education, culture. It is a great privilege to find a place in their news and the project information will remain in the “projects“ related section. The link at the end of the publication leads to the “I am not scared” portal. AEDE-EL is a national section of a European Association of Teachers including more than 15,000 members in 28 European countries. It is open to every education actors, headmasters, teachers, educators, inspectors, parents and future teachers. Created in 1956 in Paris, it pursues the following aims: to promote the notion of responsible European citizenship, to improve the awareness of European problems and possible ways to quickly create a European federation, to act in favour of a European dimension of education and the free movement of teachers and future graduates, to promote the notion of European citizenship by helping schools to create projects that bring European partners together, to organise colloquiums, congresses, conferences, debates, seminars, exhibitions, days of study... in favour of Europe. On the website, there is a link with a short article about the “I Am Not Scared” project. The “Collège Sainte-Véronique” (Liège) is a high school involved in the “I Am Not Scared” project. 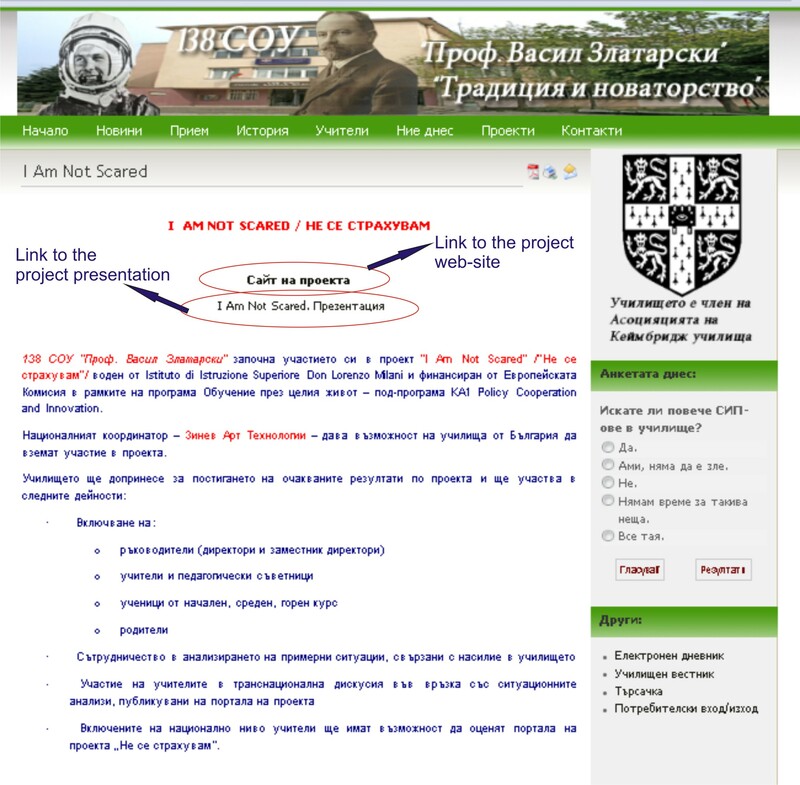 On the website of the school, there is a section dedicated to the projects and especially to the transversal projects such as “I Am Not Scared”. On this page, there is a description of the project with a link to the Portal. 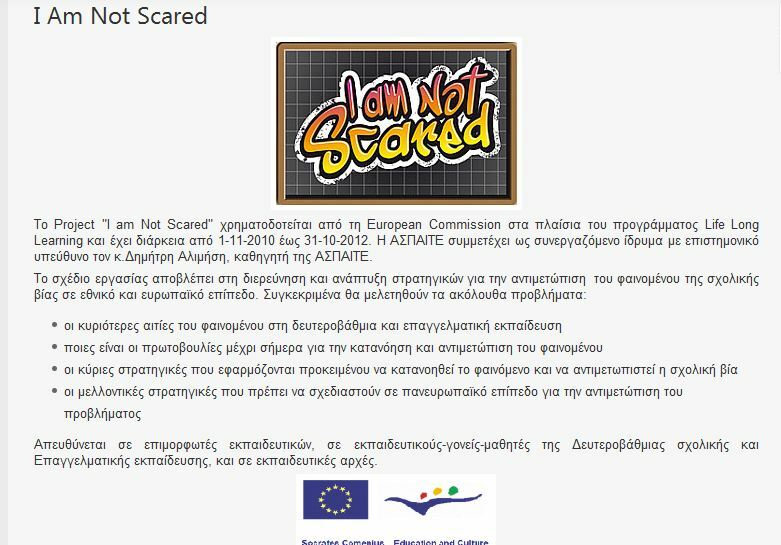 On the website of the association, a detailed description of the “I Am Not Scared” project is available with a link to the project Portal. A contact has been made with the responsible of the web site and they has been committed that they will enclose a link to the project as soon as possible. This school was invited to participate in the European project "I am not scared", and they have participated in a very active way. Some of the teachers have attended to the virtual meetings. They have included the link of the project in the school portal to spread the information among the educational community. 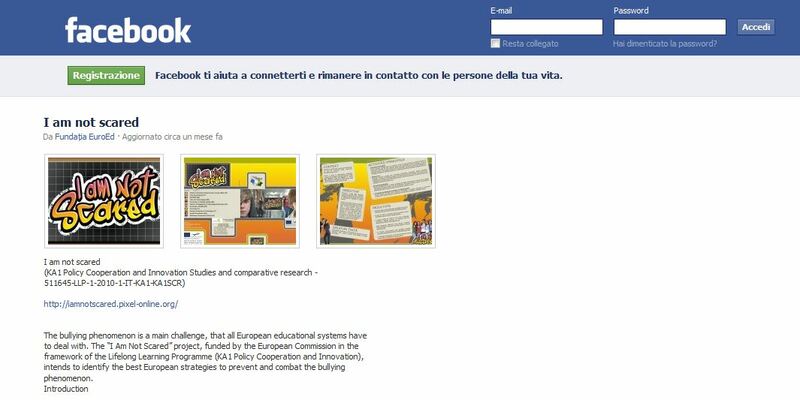 This school has also participated in the development of case studies and on their website talks about the project, and encourages the participation of the educational community in the project. 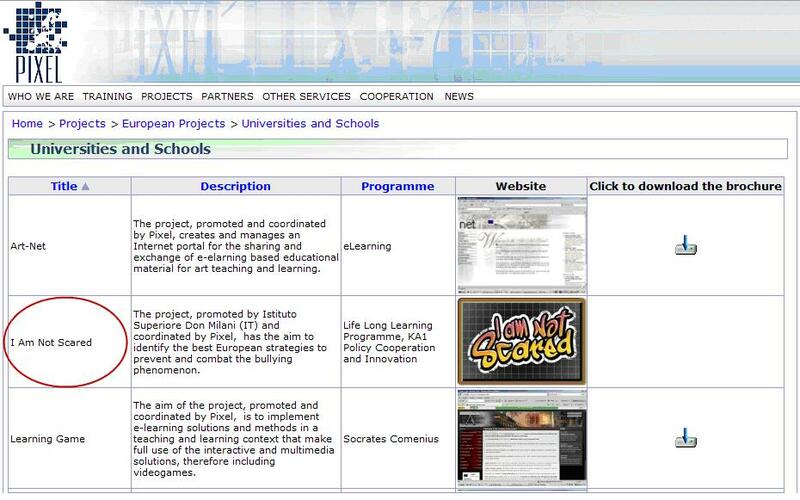 LAECOVI is research team which a big expertise in the field of school bullying and cyberbullying. It has become a reference on this topic in Europe and South America. The Conred program, included within the European project Daphne III, is designed with the intention of promoting the safe use of social networks and prevent cyberbullying. 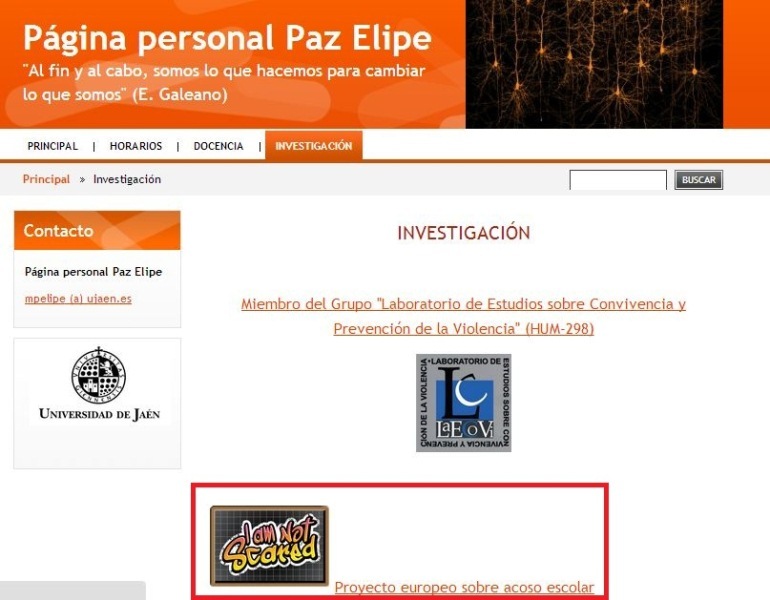 Personal website of Paz Elipe, expert on the field of school bullying and cyberbullying.